In December 2008, twentysomething Jill Grunenwald graduated with her master's degree in library science, ready to start living her dream of becoming a librarian. But the economy had a different idea. As the Great Recession reared its ugly head, jobs were scarce. After some searching, however, Jill was lucky enough to snag one of the few librarian gigs left in her home state of Ohio. The catch? The job was behind bars as the prison librarian at a men's minimum-security prison. Talk about baptism by fire. As an untested twentysomething woman, to say that the job was out of Jill's comfort zone was an understatement. She was forced to adapt on the spot, speedily learning to take the metal detectors, hulking security guards, and colorful inmates in stride. Over the course of a little less than two years, Jill came to see past the bleak surroundings and the orange jumpsuits and recognize the humanity of the men stuck behind bars. They were just like every other library patron—persons who simply wanted to read, to be educated and entertained through the written word. By helping these inmates, Jill simultaneously began to recognize the humanity in everyone and to discover inner strength that she never knew she had. 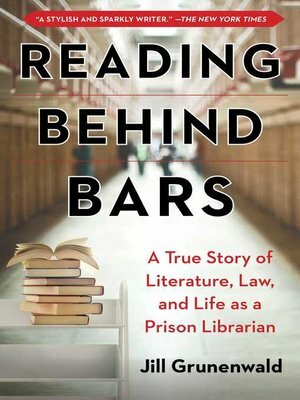 At turns poignant and hilarious, Reading behind Bars is a perfect read for fans of Orange is the New Black and Shakespeare Saved My Life.